“The next production will not have tubas nor accordions,” the duo of Ramón Amezcua and Pepe Mogt tells us. 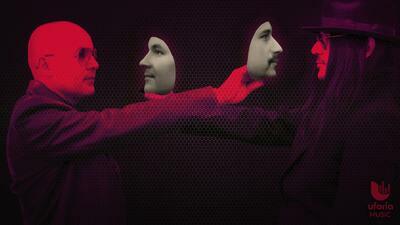 Nortec Collective are undeniably one of the most recognized musical acts to come out of Tijuana. Their smashing hybrid of norteñas and Euro techno made them internet sensations, and defined the sound of the border city when they came on the scene in 2001. Before Nortec emerged, Tijuana was a hub to a cluster of sounds in the early ‘90s. On one hand, you had those who listened to American rock bands like Red Hot Chili Peppers and Nirvana. On the other, there were those who enjoyed regional Mexican music. Then the internet exploded, and with Nortec forming in 1999 a new Tijuanense identity of electronic folk sounds was born. The collective formed with eight founding members, ranging from DJs to visual artists and graphic designers, and together they encapsulated Tijuana’s ever-evolving identity with a cunning approach. They solidified their border-centric brand via their cheeky aesthetic, which oftentimes mocked the stereotypes of the border town: like a mustachioed cowboy cartoon armed with guns, emblazoned with a bud plant T-shirt. They also portrayed conceptual album artworks, like relics of the towering U.S.-Mexico border plastered with crosses, symbolizing the death of immigrants. The members of Nortec disbanded in 2008 and paired up in new configurations. The most visible of the pack are Ramón Amezcua and Pepe Mogt, a.k.a. Bostich and Fussible, who’ve been working as a duo ever since. That same year, they released the banda-centric Tijuana Sound Machine. With three acclaimed full-lengths under their belts, the last one being 2014’s horn-blaring Motel Baja, the Kraftwerk-leaning duo made a shocking announcement: the closing of a multi-decade chapter as the reigning Nortec masterminds. “The next production of Bostich and Fussible will not have tubas nor accordions,” declared Amezcua in this interview. Keeping busy as eminent producers, they recently dropped a collaboration with Cirque du Soleil this April, entitled LUZIA: A Waking Dream of Mexico —a carnivalesque outing stuffed with the vibrant-yet-haunting sounds of Mexican folk. This full-length is in fact Bostich and Fussible's last hurrah as champions of the Nortec sound. In this Q&A, Amezcua (Bostich) and Mogt (Fussible) confirm that the act we now know as Nortec Presents: Bostich + Fussible will solely be forging a new electronic sound in their next offering. Does this also signify a new phase for Tijuana music? For a bit, the dynamic troupe of ruidosón—notably consisting of María y José, Los Macuanos, and Santos—shook up the border town’s electronic music milieu with their glitchy pre-Columbian-inspired noise. But that once-promising ruidosón scene from 2011 has slowly, steadily waned. Then, there are bands like Revulab, who proudly uphold Nortec’s sonic influences and visual aesthetic but didn’t quite take off. I spoke to Bostich and Fussible about their departure of regional Mexican music, as well as their current European tour. They play Spain’s ESTOESLOQUEHAY festival on Saturday July 2. Isabela Raygoza: Nortec Collective was part of a strong musical movement in Mexico that reshaped contemporary culture at the border, and your signature sound has remained a fixture. On the other hand, Tijuana, musically, has evolved tremendously since your emergence. Can you tell me how you’ve experienced this evolution with your music? Bostich: “The Nortec sound has been evolving since it was born [in the late ‘90s] up to this last album that we released [2014’ Motel Baja]. The evolution shows in various aspects, whether it’s technological or conceptual. Fussible, in a previous interview published on MTV Iggy, you said, “for us the Nortec sound is dead.” Do you really think that? Tijuana became known as a turbulent region, where drug lords and illegal trafficking was ever present. This was at a peak in between your artistic career [in the mid ‘00s]. How have you balanced the tumultuous times and how have they affected you? So what is this new and mysterious project you’re working out? Bostich: The project that we have right now as Bostich y Fussible has nothing to do with the Nortec sounds that mixes norteñas and banda music with electronica. We continue working with what we’re passionate with, which is electronic music: pure synthesizers, rhythm boxes. The next production of Bostich and Fussible will not have tubas nor accordions; instruments that characterized Bostic and Fussible. In fact, those were the plans after Motel Baja—to go the electronic route. But it was inevitable to accept our recent collaboration with Cirus du Soleil. For us, we did this as an opportunity to work with talented and interdisciplinary people. It was a huge learning experience for us to release a full album for them. It was a titanic task. When will it launch? Will it still be released under the Nortec brand? What can your European audiences expect in this tour? Will you be playing new tracks from your upcoming production? Will there be any Mexico or US dates?